In case of crisis and system mess up, System Restore is great option to deal the situation. 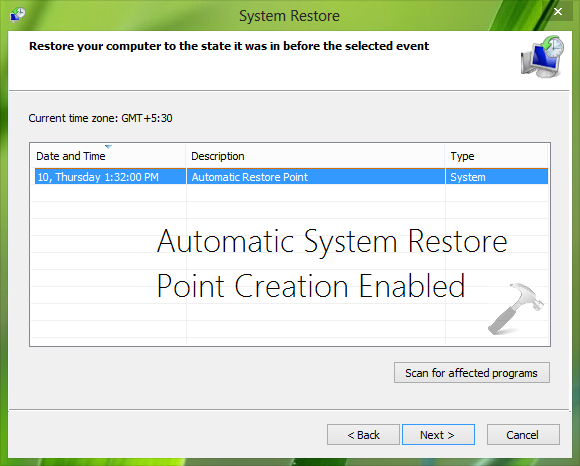 If you don’t know how to create System Restore point then go here. By default, Windows has the ability to create System Restore point(s) automatically so that you can use these points to restore your system to earlier date. However, in some cases we found that Windows was not creating System Restore point(s) automatically, and thus in this case when you go to System Restore wizard, you’ll see no points created there. 1. Press + R and type sysdm.cpl and hit Enter key to open System Properties. 2. In the System Properties window, switch to System Protection. In the Protection Settings section, select the drive on which automatic System Restore point creation is disabled and then click Configure. 3. In the below shown window, under Restore Settings, select Turn on system protection. Click Apply followed by OK and in this way close System Properties window. 4. Press + R and type taskschd.msc and hit Enter key to open Task Scheduler. 5. In Task Scheduler window, in left pane, expand Task Scheduler Library -> Microsoft -> Windows -> SystemRestore. Refer to below shown screenshot, in the middle pane, right click SR and select Enable. When you’re done, close Task Scheduler window and reboot the machine to make changes effective. 6. Now give Windows some time (may be up to a week) to create automatic System Restore point and check back later. You’ll find an automatic System Restore point is there when you open System Restore wizard. I was have lot of problems with my HP Pavillion and repeated system restores did not help. I backed up all my files on a flash drive and on a set of five dvds. After I did a reset to factory settings I am having trouble restoring files from both flashdrive and dvds. ^^ What happens what you move files, did you see any error messages, warnings? Let me know to help you further!